So, this past month has been hard (if you wanna know why click here)and I haven’t kept track of our purchases. And it was very interesting, because when I decided I had other things to worry about other than adding up all our expenses, I started to see myself not caring. I’d think, “it doesn’t matter if I spend a lot on groceries, after all I’m not going to add it all up this month.” What a reminder that it really does help to keep track of where our money goes! So this month I’m starting all over again, but I’m going to try to a challenge. The lowest I’ve had our grocery bill has been about $250 a month. So I’m going to try to see how low I can get it this month. I really want it to be under $250, and hopefully a lot under! I’m going to keep track of all the food I buy and I’ll keep you posted. This is only for food items and does not count toiletry items or eating out, however I’ll keep track of those things too and maybe show you the results. Shop at Sam’s Club (using my price book to make sure what I’m buying there is actually cheaper than other stores). Buy sale items (checking out sales online before hand). Stocking up on good deals that won’t go bad before we can eat them. Going to multiple stores when there’s really good deals. Cooking with cheap ingredients (beans, potatoes, oatmeal, rice, in season produce etc…). Wasting as little food as possible. I’m even thinking of maybe keeping track of all wasted food. A lot of other blogs do that. Going grocery shopping every other week instead of every week (if I plan well enough hopefully I won’t even need to run to the store for milk or produce in between my regular trips). Cook with food I already have (pantry and freezer). Use any coupons I find on internet, get in the mail or see in the store (but only if it’s something I actually use). Cooking from scratch, rather than buying already made meals. Plan, using what I already have, sale items and coupons to help me. So in conclusion I want to keep our food groceries well under $250. It’s my personal challenge for the month of June. Anyone else want to join me in a grocery budget challenge? How much do you plan on spending for you or your family? How do you plan on keeping under the budget? 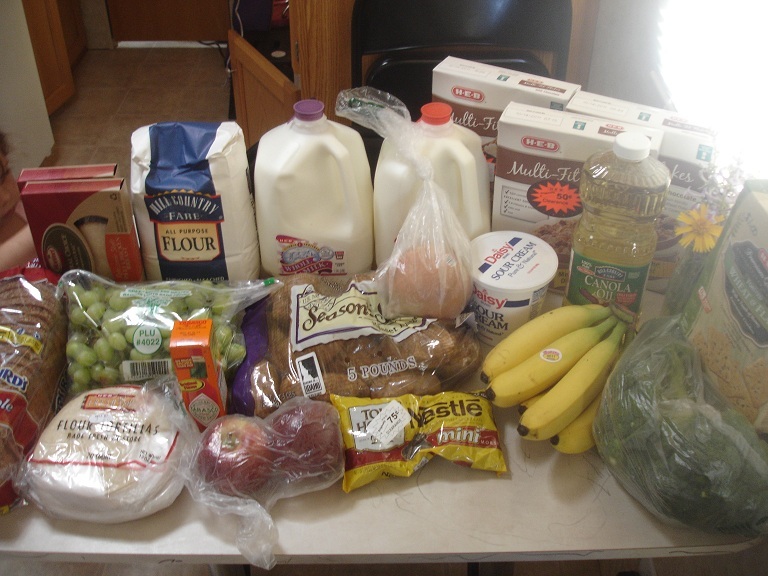 Thanks for sharing the money saving tips for groceries. I am always looking for strategies to lower our food bill. I am going to track my expenses for the month and set a goal for next month. I would assume food bills will be a bit higher since kiddos are now out of school? Extra friends over, etc. Let me know how it goes! And if you have any other ideas on how to save on groceries!